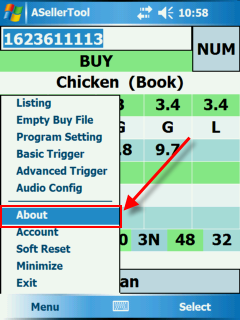 The About window will show some small amount of information about the program and pricing database that is currently on the PDA. Version: This is the current version of the program installed on the device itself. 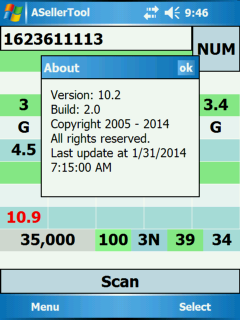 The build number underneath is for internal use and is not needed by the User. Last Update at: This will show the data and time of the last update performed. It will also state if an SD card cannot be detected in the PDA, or if an SD card is detected, but no data files are found. It should be noted that there might be problems with the pricing database even if a last update date is shown here. Make sure you soft reset your PDA after each download to be certain of functionality.